Located in Sharon, Pennsylvania, just a mile from the Ohio border, is the flagship store of Daffin’s Candies. This store is billed as the “Largest Candy Store in the World.” However, let’s just start off by saying that’s definitely not true. I don’t know if it was a marketing gimmick or if it was once potentially true, but I feel confident in saying that it’s not even the largest candy store in Pennsylvania (Hershey’s Chocolate World, for one, is almost certainly larger). 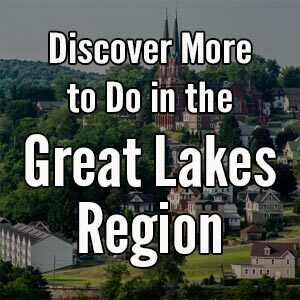 Interestingly, Sharon is also home to the “World’s Largest Shoe Store” and the “World’s Largest Off-Price Fashion Store,” so maybe this gimmick is a local contrivance. Daffin’s Candies is Sharon is large, but it’s definitely not the largest candy store in the world. However, despite the dubious claim, that doesn’t mean that you should skip Daffin’s Candies. In fact, if you find yourself in Mercer County, it’s quite a neat and tasty place to stop. 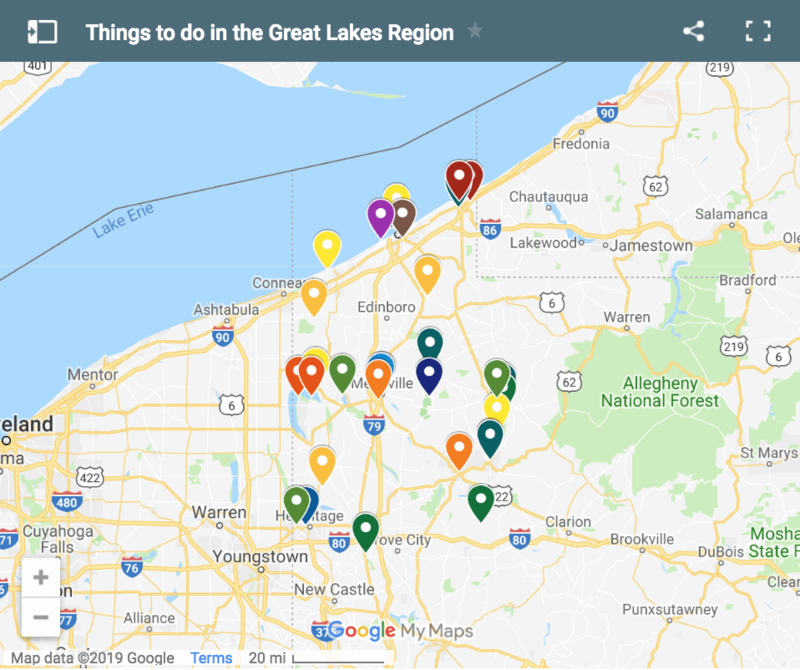 Daffin’s Candies has been in existence since 1903 when George Daffin opened for business in Woodsfield, Ohio, which is about 75 miles southwest of Pittsburgh. 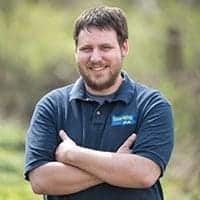 After moving the location of the business a few times in the coming decades, it finally settled in Sharon, Pennsylvania in the years after World War II. 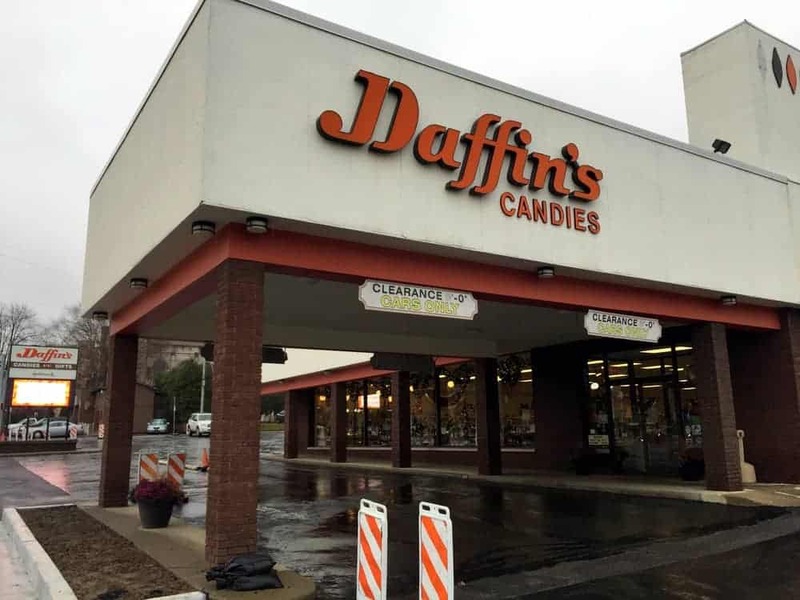 Daffin’s Candies flagship store is said to be 20,000 square feet in size and is located in a former grocery store just outside of the downtown core of Sharon. Daffin’s has been located here since 1975, and their chocolate factory is just a few miles outside of town. 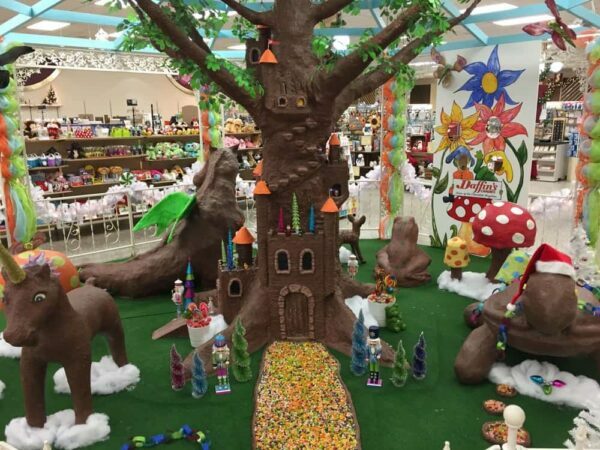 Daffin’s Chocolate Kingdom features several large chocolate sculptures. I stopped by the store on a quiet weekday in November eager to check out not only the store, but also Daffin’s Chocolate Kingdom. After being briefly disappointed that there claim as the “Largest Candy Store in the World” was untrue, I was still happy to discover a large chocolate store that makes quite delicious chocolates. In addition to delicious chocolates, the store is also filled with a Hallmark Store and their chocolate kingdom. 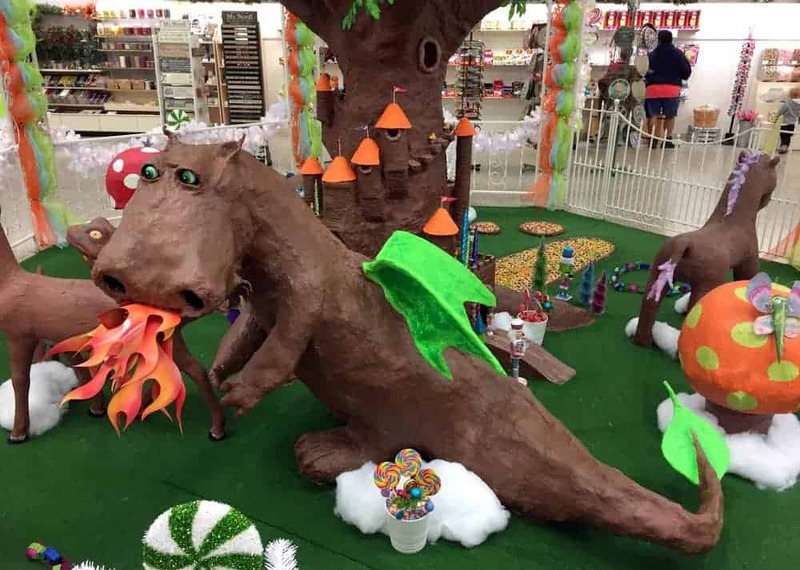 Daffin’s Chocolate Kingdom takes up two parts of the store as of late 2018 and features large chocolate sculptures. In the center of the store is a brand-new display that opened in October 2018. 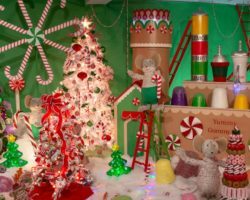 The display is centered around a 14-foot tree made from a chocolate-covered frame. A path of jelly beans leads up to the tree, which has several castles built into it. A 14-foot chocolate tree is surrounded by other chocolate creations. Surrounding the tree are several animals, all made entirely or mostly out of chocolate, including a unicorn, a dragon, a turtle, two deer, and a frog. These animals are quite impressive to look at, and it’s fun to check out the intricacies of each. Hidden in the back of the store is the second half of Daffin’s Chocolate Kingdom. 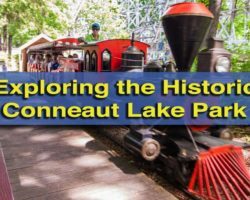 This section of the display is much older, dating back several decades, and a visit to this portion of the kingdom has become a tradition for many local families. 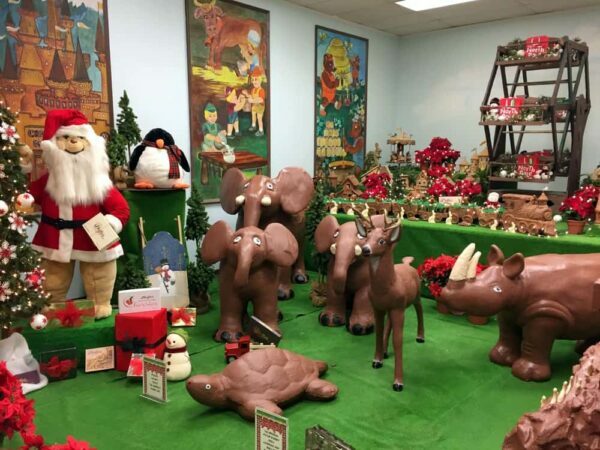 Daffin’s Chocolate Kingdom includes a 400-pound chocolate turtle, a 125-pound reindeer, and a 75-pound frog. There are also many other large and small creations, as well as a Ferris wheel made partially out of chocolate. Of course, Daffin’s doesn’t just have giant chocolate sculptures; they also sell chocolates. The second half of Daffin’s Chocolate Kingdom is located in a room at the back of the store. 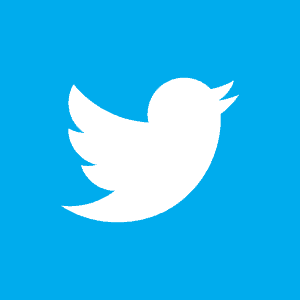 All of Daffin’s chocolates are made in their factory just a few miles away. 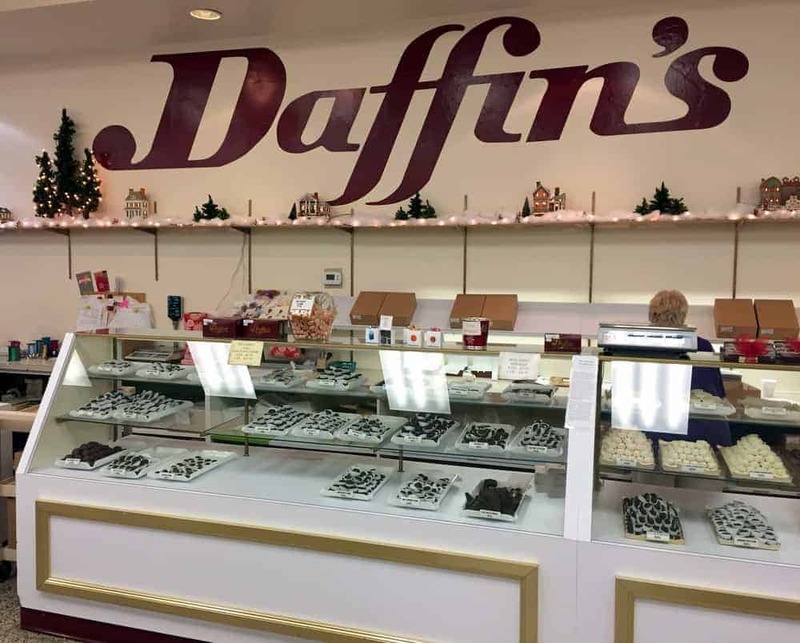 Unlike many chocolate shops, Daffin’s makes all their own chocolate and fillings, ensuring that their candies have a unique taste you can’t get elsewhere (outside of their four other locations in PA and Ohio, of course). Along one wall of the store, there is a large counter filled with higher-end chocolates that are sold by the pound. There is quite a great selection here, and you’re sure to find something delicious to take home with you. The middle of the store is occupied with pre-packaged candies ranging from assorted chocolate boxes to seasonal and whimsical shaped chocolate lollipops. Along the other wall, there is a large selection of assorted candies for those looking for something not made of chocolate. There are many delicious chocolates for sale at Daffin’s Candies. I had a chance to take a few of Daffin’s chocolates home with me, and I can attest that they do make some very delicious treats. Ultimately, if you go into Daffin’s Candies with the right expectations, you are sure to have a good time. Daffin’s Chocolate Kingdom is a bit on the small side, but still quite impressive thanks to both the size of the sculptures and the craftsmanship. The claim of being the “World’s Largest Candy Store” is honestly almost comical, but it is still a large chocolate shop filled with some delicious treats for any chocolate lover. 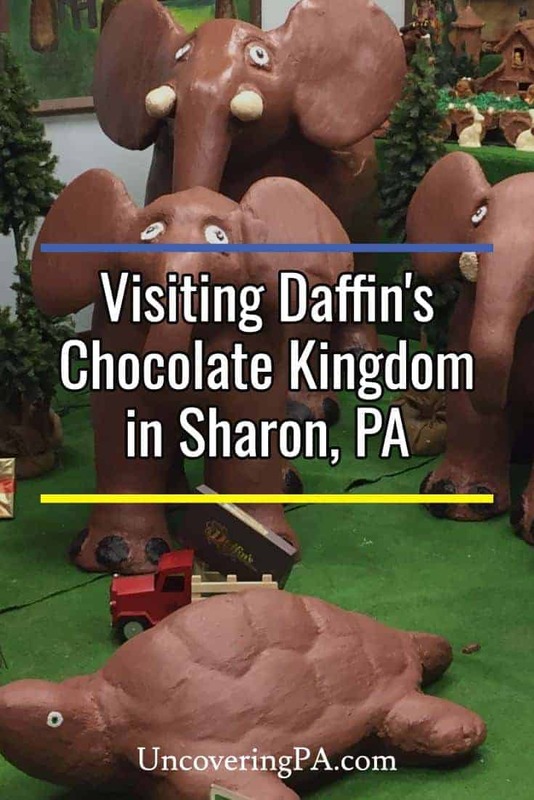 If you find yourself in Mercer County or driving along Interstate 80 in western Pennsylvania, a stop at Daffin’s Chocolate Kingdom in Sharon is a fun detour. 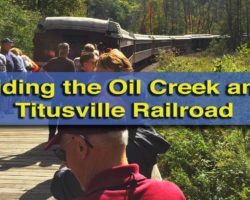 Looking for more fun things to do in the area? 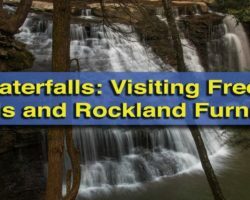 Check out Kraynak’s Christmas Display, Springfield Falls, the last covered bridge in Mercer County, and the covered bridges in Lawrence County.